In the fall of 2003 I adopted a pair of kittens from a co-worker. One of her cats had a litter two days before my birthday and we had a mouse problem at home. So around Halloween when they were a few weeks old she brought them in for me to meet. The first one I picked was a male orange tabby who was terrified of the height when I picked him up. He clung tightly to my sweater, almost hugging me, and won my heart. I planned to get two, so they’d have companionship when I was at work. So I chose a companion for him, a female calico whose coloration is called blue tortie. Her original name was “Scary” because the first time she saw her reflection in a mirror, she arched her back and hissed at it. His disposition was bright and cheerful, so I called him Sol. She was moody and mottled like the moon, so I called her Luna. I told my housemate Mike that I didn’t want them going outside and had adopted two specifically to keep them entertained indoors. In the mountains of Colorado where I lived there is a perpetual threat that they’ll become prey. Also, it seems that house cats are a threat to song bird populations. Even for animals that aren’t so threatened (like mice) a well-fed house cat can take away a lot of food from native predators like owls, hawks, eagles, bobcats etc. House cats often don’t eat their prey if they’ve been well fed. On the other hand, when the mice are indoors they’re out of reach of the predators, so I have no qualms about the cats hunting inside. Hantavirus spreads through mouse droppings and is a particular concern in the west. The smell of cats alone can sometimes deter mice from even moving in. Both cats were let outside despite my wishes. Sol disappeared within six months of adoption. Then one night a month or so later we found Luna outside in a state of shock, having apparently been attacked. Based on the location of the puncture wounds on both sides of her abdomen, it looked like she was in a coyote’s mouth and somehow escaped. In my Picasa album for Luna, there are a couple photos of her in recovery with most of her fur shaved off, save a nice mohawk down the back. I’m not embedding those photos here because that’s not how I remember her. The story is important enough that it can’t be omitted from this tribute. That coyote attack eventually led to significant changes in my life. I took her to the vet early on a Sunday morning. First they took x-rays which showed damage to internal organs. Then they performed exploratory surgery to further determine what was wrong. By the time we had an assessment (punctured intestines and kidney) I was in over $800. I couldn’t stop at that point, so I authorized them to do the surgery. By the time it was over I had nearly $1800 in vet bills. Had I known up front the costs I might have made a different choice. I put most of it on a credit card because I didn’t have cash on hand. It wasn’t a serious hardship for me to pay off later, but I didn’t want to risk being in that position again with a housemate that didn’t honor my requests. I made a decision late in the summer of 2004 to leave my beautiful mountain home and move with Luna to an apartment in Capitol Hill, within walking distance of my office in downtown Denver. I had other reasons for moving. The driving commute was tough, especially in the winter. I missed the social parts of life. I also felt that I’d gotten used to the beauty of the mountains and was taking it for granted. I hoped that city life would make vacations in the mountains more meaningful and enjoyable again. I wanted to be able to walk to work or concerts. I wanted to be able to order pizza and have it delivered. I found inner city life new and exciting and it suited me well for a while. For some of those years my girlfriend Renee lived with me. Luna was almost like our child. We doted on her and she knew she was a princess. She was bored as an indoor cat so we entertained her with felt mice flipped across the hardwood floors. We also made her pillow forts to explore, and gave her boxes and bags to play in. Like most cats, she loved the laser pointer too. I even bought little radio controlled toys like a flying UFO and miniature car, just to mess with her mind a little. I gave her all the exercise and entertainment I could think of. The next few years of her life were mostly spent on a cat tree that I bought for her. She had a view of squirrels and birds from the window. She also knew when I was walking down the street, and Renee said that she would be waiting and meowing at the apartment door even before I’d entered the building. A few times I took her outside on a leash and body harness. Our “walk” usually turned into a “drag”. She seemed almost paralyzed in that harness and didn’t want to move. Once a stray dog came roaming down the alley and went after her. She escaped from me, and I should have taken that as a sign. I tried again, the next time taking her out in front of the apartment building on the sidewalk. One night a drunk Indian stumbled by. When he saw her, he assumed his best kung fu pose, one leg up, arms arched like claws, hissing at her. She actually jumped right out of the body harness. I managed to catch her before she could get away and never again took her for a walk. There were periods of time while living in the city that I was very depressed. I saw at least three different therapists over six years and was intermittently on medication for both depression and anxiety. There were times when I wanted to die and Luna was my last reason for living. Who would care for her the way I did? I felt that she fully repaid me for saving her life by giving me a reason to live, and giving me affection in times when I needed it most. In the spring of 2010 I took a job running Radical Honesty Enterprises in Virginia. Initially it was by agreement that I would continue living in Denver. Soon I came to see that I needed to move there to be effective. I was taking 7-10 day trips every month, while relying on the help of my neighbors to feed her. When I returned from those trips she would be hoarse from crying while I was gone. That was not fair to her, and I wasn’t getting enough done on those trips and needed to stay a little longer each time. If I moved Luna to Virginia, she would have to be an outdoor cat. I knew there were foxes and coyotes around and I had heard them singing at night on my trips out there. I also knew it would be very cold during winter in the Blue Ridge mountains. I learned that my friend Chelle was thinking about getting a cat, so after some discussion we decided that I’d bring Luna out to live with her family in Cary, NC on my way to Virginia. The flight out was very hard on Luna. The regulations given by Southwest Airlines say the cat carrier has to fit under the seat in front, and also that the animal has to be able to stand up and freely turn around. These are mutually exclusive for any adult cat. I chose a direct flight. Carrying her through the security scan checkpoint was difficult. There were hundreds of people around in a very busy place that was utter chaos to her, so she tried to escape in fright. Getting her in and out of that miserable carry-on container while also dealing with the other parts of airline security checks (shoes, belts, laptops etc) was a challenge, but at last we made it onto the flight. She was so hot by the time we got to Chelle’s house in Cary that her tongue hung out further than I imagined was possible. She panted non-stop for hours trying to cool off. Even in the air-conditioned environment it took a long time for her to adjust to the new altitude and humidity. I spent the night there on July 23, 2010 and the next morning was the last time I held Luna in my arms. She slept with me for part of the night, and then got on top of my bag. I interpreted this as asking me not to leave her behind. Luna had a couple of particularly endearing habits. Every time someone sneezed she would meow a response, as if saying “bless you”. She could also discern when we faked sneezes to show this trick off and always refused to perform on demand. She liked to sleep on my chest and would wake me up by licking my nose in the morning. Anytime I held her to my face she would lick my nose. So that was how we said goodbye. She followed me to the door wanting to come with me. I left early in the morning of July 24, 2010 to go to Ohio and visit my Mom who was recovering from surgery. From there I took a train to Virginia to my new home. Chelle kept me posted on Luna’s life with photos, texts and updates on Facebook. Eventually Luna got her own Facebook page, Princess Luna. One time Chelle called me asking if Luna might have eaten a bird that apparently flew in through an open window because there was nothing left but a few feathers. She had a good home there with a nice balcony from which she could watch birds and other wildlife around a lake. I periodically had nightmares that I was coming home to my Denver apartment from a trip and would find her starving to death. I felt guilty that I had to leave her alone so many times right before I moved. I worried she didn’t understand why I left her, and that she still missed me and grieved for me (as I grieved for her), waiting for me to return. I knew that she would eventually adjust to her new life and be loved and cared for very well. I was in Charlotte, NC once a year later and missed a flight and tried to go to Cary to see her. The timing just didn’t work out… it was too far and too late. Several other times I thought about renting a car and making the six hour trip from Virginia to see her, but it seemed very excessive and I figured business would take me that way again sooner or later. While living in Virginia I started a new relationship and in the fall of 2011 I moved in with Heather in Silver Springs, Maryland. The next year we decided to move to New Mexico, two years to the day I left Luna to move east, we arrived in our new home in northern New Mexico. If Chelle had ever called me and said she couldn’t care for Luna, I would have driven back to get her and cared for her again. Heather has a couple cats of her own that already don’t get along well with each other (which is typical of female cats). I’m pretty certain Luna would have disliked both of them too, and it wouldn’t have been a good fit. Thirty months to the day that I left her, at 1:24 am on Thursday, January 24, 2013 my phone chirped. I missed a call and had a new voice mail. The text message transcription service on my screen had the words “Cary Veterinary Clinic” and “Luna”. I called them immediately, fearing the worst. Katy answered and said that Luna had been hit by a car and the woman who hit her brought her in. She had head and facial trauma, and was very cold and in shock and so they were doing what they could to get her stabilized and warmed up. They’d gotten my number from the chip implanted in her. So I gave them Chelle’s number, and then texted her as soon as we hung up (so as to not tie up her phone while they tried). She replied shortly and confirmed Luna had gotten out and was waiting for her to come back. I was up until 2am when I finally decided there was no point to depriving myself of sleep. I went back to bed for a couple hours, and woke again around 4:30. 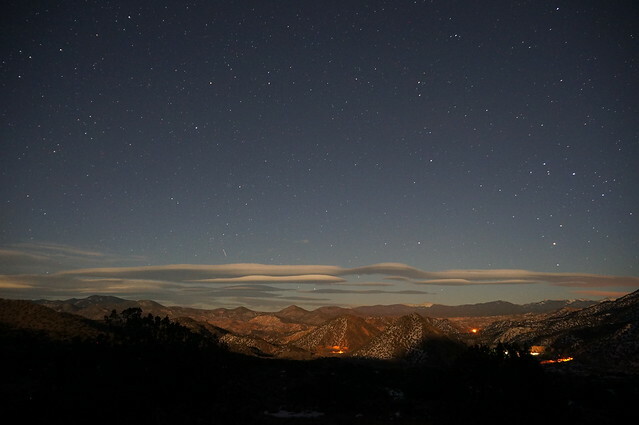 I got a drink and looked out the kitchen window to see a fantastic scene of lenticular clouds illuminated by the setting moon. I knew that I had to get dressed and put my cameras out on tripods to make a time lapse video of the scene. Such a strange morning, my heart filled with joy at this scene and deep grief at the loss of a beloved pet. Once the cameras were set, I found myself debating whether to stay up for the sunrise or try to get another hour of sleep. As I was fiddling with my phone trying to decide, the vet called again. They hadn’t been able to begin real diagnostics without a credit card deposit and they asked me if I could pay for it. Unfortunately I was very broke and didn’t even have credit to fall back on. They mentioned that Chelle was trying to reach her Dad to get his credit card. I knew that Luna’s condition was serious and that even with very costly surgery, she might not survive. I didn’t want Chelle or her father going into debt on the slim chance she could be saved, given apparently significant head trauma. I texted that message to Chelle, and broke down sobbing as I accepted the finality of it. Shortly afterward Chelle went in to be with her and say goodbye while they euthanized her. Both vets said that was the best choice because she was too badly injured and probably wouldn’t recover. We tried to get the contact information for the woman who brought her in to thank her. So many people might have let her suffer and die in the road. I’m glad that Chelle was there to give her a couple years of good life and a loving family. I’m glad she was there to say goodbye to her for me at the very end. I still feel that I abandoned a being who loved me totally and unconditionally and I still have guilt for doing so. I also know cognitively that I did the best I could for her even if she couldn’t understand what was happening. In my guiltiest conscience, she was in the road looking for me the night she got hit. I know that probably wasn’t true, but still the thought occurred. I appreciate all the friends, family and even strangers who reached out to me through Facebook and email to express condolences and share my grief over Luna. My experience of first getting onto Facebook in the fall of 2009 involved learning of the suicide of Chris Jaycox, a friend from college that I never got to say goodbye to after he left school. I finally found his grave on my journey back West last spring. The community of our mutual friends online made grieving his loss better than it would have been otherwise. I appreciate Renee for all the years she spent caring for Luna while living with me, for playing with her and feeding her and cuddling with her. Thank you also for all the wonderful photos you took including some of the ones here. I appreciate Chelle for taking Luna in July 2010 when I couldn’t care for her the way I wanted to any longer, for giving her a home and love and Facebook page and being there at the very end. Both the loss of Chris and Luna have moved me artistically. With Luna, knowing she was gone while I was making a time lapse of a stunning galaxy rise gave me a way to remain present to my grief that is hard to describe. Picasso said that “Every act of creation is first an act of destruction.” Sometimes, that isn’t merely destroying the blankness of a canvas with paint. Sometimes life destroys something and from those pieces we then have to find a way to make something new, if we have any hope to heal our wounds. I don’t see what other choice we have. This is the time lapse video made of the morning Luna died. It Blew My Mind and Heart – The Milky Way is rising at dawn now, with Scorpius off to the right of the frame. The soundtrack is AlienFX by Seraphic Panoply used under Creative Commons license (CC BY-SA 3.0). The title of this sunrise describes my experience of it. I lost a cat named Luna today in a car accident. Just as dawn was breaking and I was filming this I got the call that meant she had no hope of surviving. What a strange day, my heart is so heavy with the grief of a loss and simultaneously overjoyed at such beauty before me. I have your portrait here and am so happy I had it painted and can look at you every day. I have many photos I took of you over the years posted online where I will leave them forever. I have wonderful memories of the 7 years we had living together. I’m so sorry I had to give you up and couldn’t explain in a way you would understand. I’m also so sorry you lost your brother and grieved him. I love you and will never forget you. Goodnight sweet princess. I’m sorry for your loss. Luna was a very cool cat. I have some very fond memories of hanging out with Renee and Luna. Renee would call me to come over when she missed you, when you were out of town. I too have depression and understand how hard it is to loose a beloved pet. I wish I could put all my thoughts into words as eloquently as you do. If their is anything I can do, or if you want to talk, let me know. Thank you Casey! I appreciate you for what you’ve written and ongoing support online, and am sorry you’re not next door in Colorado anymore. I had the pleasure of spending time with Luna when she lived with Chelle. She was such a sweet gal and always came to visit whenever I was around. It was touching to read your dedication to her.